Earlier in this series we saw how adidas’ instigation of pinstripes in 1980 kick-started a continental influence on kit design. 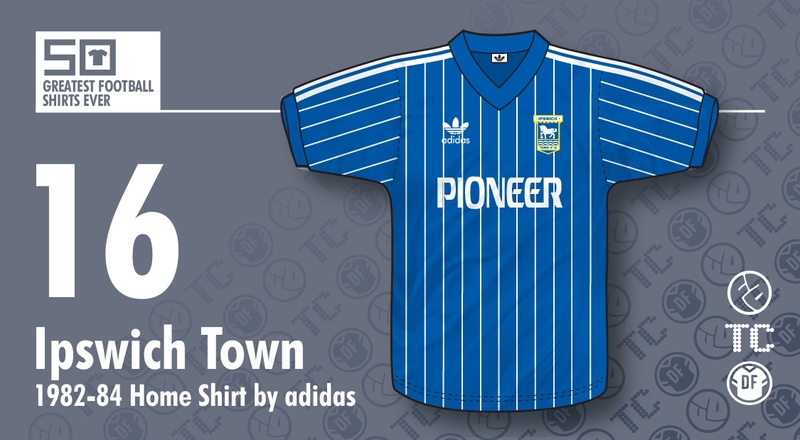 A year later the fashion finally made it to the UK with one of the best examples of the genre - the Ipswich Town shirt worn in the halcyon days of Bobby Robson’s management, sported by stars such as Paul Mariner, Arnold Muhren and Terry Butcher. There were (and in fact still are!) plenty of pinstripes around in football, but when they form part of a shirt featuring non-contrasting neck and cuffs they do seem to exude that little extra ‘je ne sais quoi.’ I guess its the perverse nature of stripping away contrasting colour from the functional elements of the design before then adding it again, purely as decoration, elsewhere on the shirt. It's confident (or arrogant?) and extravagant in the extreme, but actually is precisely what you need when you’re dressing a football team when their confidence is paramount to performance. As if to prove a point, this is yet another example of a superb kit accompanying a superb team (for those who may not remember, the early 1980's found the Tractor Boys’ stock much higher than it is today) although to be fair, their peak had arguably just passed when these pinstriped beauties were called into action. 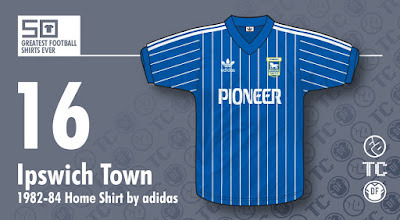 The shirt is also memorable for the inclusion of Ipswich’s first ever sponsor, electronics company Pioneer. The early versions of these shirts (as worn in pre-season photos) featured the firm’s solid but relatively squat logo. Clearly there were concerns about legibility and brand awareness as soon into the season these jerseys were replaced by new ones that featured, in a move to make all graphic designers wince, a condensed but much larger rendering of the Pioneer logo. The European flavour of this shirt is clear to see (quite apt given the club’s success in the UEFA Cup the previous season) and for my money produced, along with its white away and red third counterparts, one of the classiest and most stylish sets of kits of the decade.